President Donald Trump held a historic meeting with Russian President Vladimir Putin Monday in Finland, using some kind words to describe his budding relationship with the world leader. The comments that followed the meeting were the most recent in a string of them stemming from Trump’s interactions with heads of state where he turned the tables on existing ties, either reversing a historically poor relationship or making a longstanding friendship unexpectedly uncomfortable. Here is a rundown of some of the most controversial comments Trump has made in connection to fellow heads of state. The G-7 conference ended in early June with something of a war of words between North American neighbors. 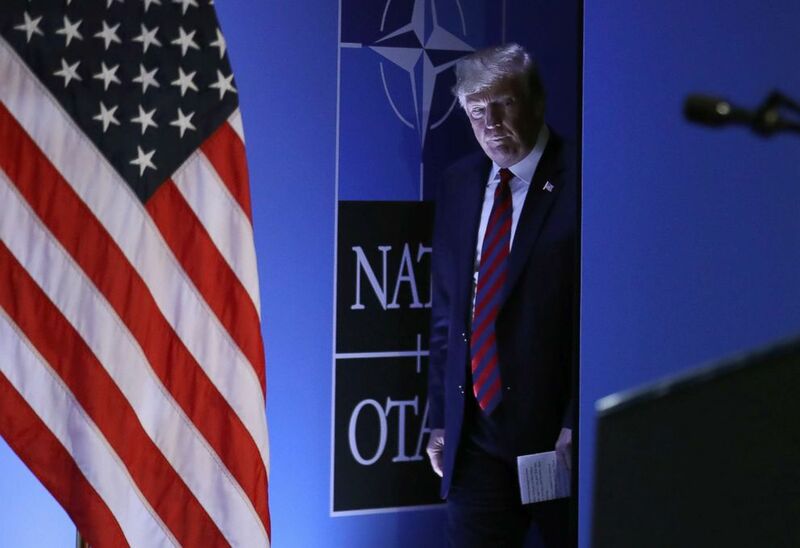 President Donald Trump arrives for a press conference on the second day of the 2018 NATO Summit on July 12, 2018 in Brussels, Belgium. After the meeting, Canadian Prime Minister Justin Trudeau announced that Canada will "not be pushed around" by the United States with its decision to slap tariffs on some imports from Canada and other countries. "For Canadians who … stood shoulder to shoulder with American soldiers in far-off lands and conflicts from the First World War onward ... it's kind of insulting,” Trudeau said. Trump, who was on his way to meet with North Korean dictator Kim Jong Un, responded on Twitter June 9, accusing Trudeau of being duplicitous as well as "dishonest & weak." He later told ABC News chief anchor George Stephanopoulos about the situation in an interview immediately after the North Korea meeting. "Everybody was happy" at the end of the G-7 conference, Trump said. "And then he [Trudeau] gave out a little bit of an obnoxious thing. I actually like Justin. I think he’s good. I like him but he shouldn't have done that. That was a mistake that’s going to cost him a lot of money." 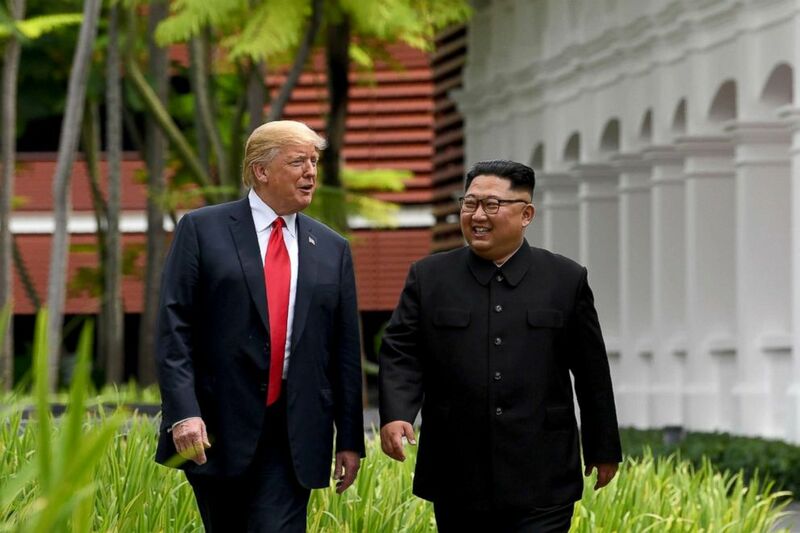 Trump called the North Korean dictator "a very worthy, smart negotiator, absolutely," while standing alongside Kim in Singapore in June. "I do trust him, yeah," Trump said in an interview with ABC News chief anchor George Stephanopoulos in Singapore immediately after the summit. "Maybe in a year you’ll be interviewing and I'll say I made a mistake. It's possible. We’re dealing at a high level. A lot of things can change; a lot of things are possible. At another point shortly after the summit, Trump praised the North Korean leader again. 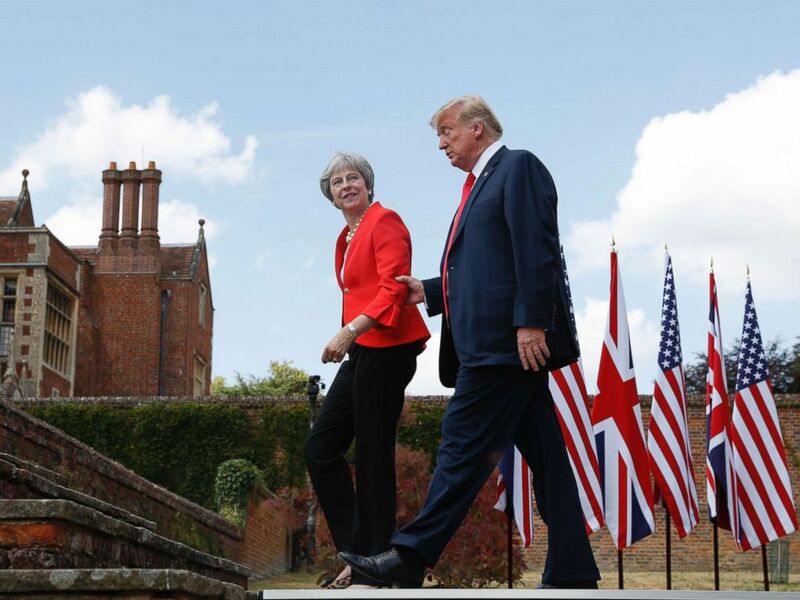 President Donald Trump walks with British Prime Minister Theresa May at the conclusion of their joint news conference at Chequers, in Buckinghamshire, England, July 13, 2018. An interview that Trump gave to British newspaper The Sun was published while he was visiting with Prime Minister Theresa May in England, and it added a pinch of awkwardness, given some of his comments. The Sun reported that Trump insulted May's handling of the Brexit negotiations, the ongoing effort to remove the U.K. from the European Union, saying May has gone "the opposite way" from the tough stance he suggested she take, and the results have been "very unfortunate." He also said in the interview that he thinks she is "a very good person." In a joint news conference held hours after the interview was published, Trump said, "I didn't criticize the prime minister. I have a lot of respect for the prime minister." "When I saw her this morning, I said, ‘I wanted to apologize.’ She said, ‘Don’t worry, it’s only the press,’” Trump said. Beyond the apology, Trump went on to praise May. "She will do very well. I think she's a very tough negotiator," he said of May, going on to call her a "very, very smart and determined person ... She left a lot of people in her wake. She's a very smart, very tough, very capable person, and I would much rather have her as my friend than as my enemy, I can tell you." When asked to further describe their relationship, Trump said, "I would say I give our relationship in terms of grade the highest level of special ... Now especially after these two days... I would say the highest level of special." While Trump has said much about Merkel and his relationship with the German chancellor in the past, his most recent high-profile comments were directed at her country and its policies, as opposed to her personally. 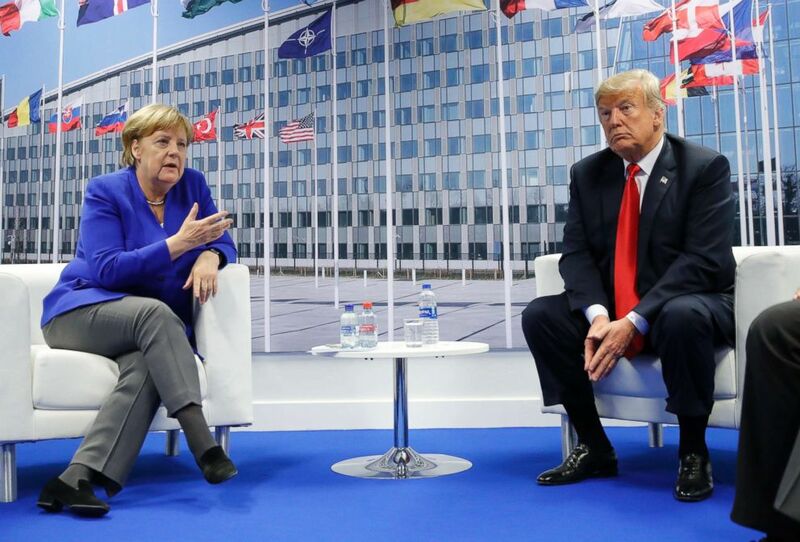 During a breakfast meeting with NATO Secretary-General Jens Stoltenberg at the recent NATO summit, Trump repeatedly said Germany is "captive to Russia." "I have to say, I think it's very sad when Germany makes a massive oil and gas deal with Russia where we're supposed to be guarding against Russia. "We're supposed to protect you against Russia but they're paying billions of dollars to Russia and I think that's very inappropriate. During an interview with CBS that aired Sunday, July 15, Trump was asked to name the biggest global foe. The first one he named? The European Union. "Well I think we have a lot of foes. I think the European Union is a foe, what they do to us in trade. Now you wouldn't think of the European Union but they're a foe," Trump told CBS. "Russia is a foe in certain respects. China is a foe economically. Certainly, they are a foe. But that doesn't mean they are bad. It doesn't mean anything. It means that they are competitive. They want to do well and we want to do well," he said. After that interview aired, Trump turned to Twitter to paint a rosier picture, saying "we had a truly great Summit that was inaccurately covered by much of the media. NATO is now strong & rich!" 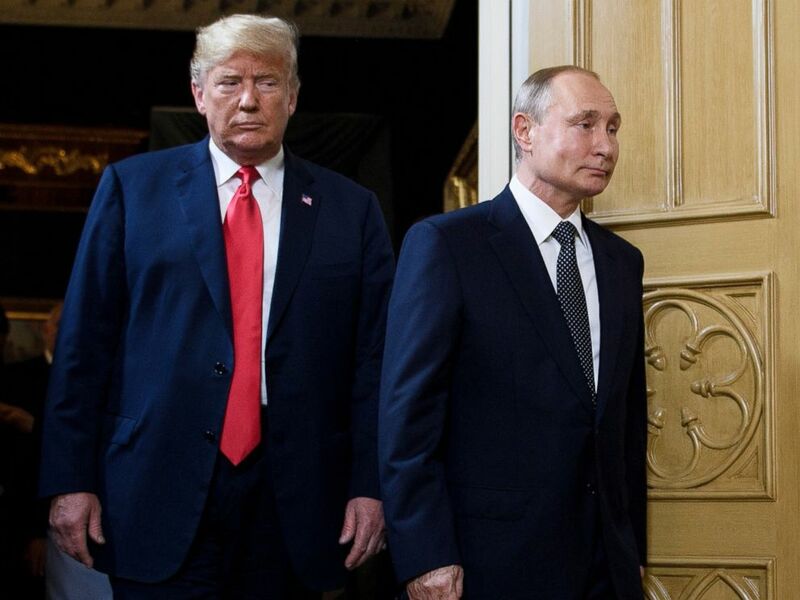 President Donald Trump and Russian President Vladimir Putin arrive for a meeting in Helsinki, July 16, 2018. Trump has praised Putin in the past, including during his presidential campaign. But in his recent comments, he's been focused on his hopes of a good relationship to come. "I think I'd have a very good relationship with President Putin if we spend time together," Trump said Friday, July 13, during a news conference alongside British Prime Minister May in England. "And I may be wrong. You know, other people have said, ‘It didn't work out.' But I'm different than other people." "I think that we would have a chance to have a very good relationship with Russia and a very good chance -- a very good relationship with President Putin. I would hope so," Trump said before meeting with Putin in Finland. During a joint news conference held after their meeting, Trump said the relationship between the United States and Russia -- which he said was at an all-time low -- "changed as of about four hours ago." Trump noted that he has called Putin "a competitor" in the past but "the word competitor is a compliment."